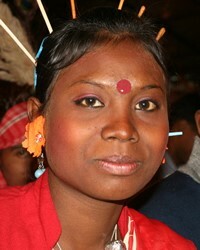 The Munda people are any of several more or less tribal groups who inhabited a broad belt in central and eastern India. They mainly inhabited the region of Jharkhand, even though they are well spread in the states of West Bengal, Chhatisgarh, Orissa and Bihar. Munda generally means headman of the village. Mundas have their own religion known as Sarna. Sarna stresses the belief of one God. Mundas believe in the supreme being known as the Singbonga, which means the Sun God. According to the Mundas, he saves them from the external enemies and troubles of life. In Sarna the Mundas worship the nature. The Mundas are highly superstitious people. Their distinct religion does not have any written code of moral laws. The ides of what is right and wrong is the adopted from their traditions and cultures. Some of the Mundas also worship Lord Shiva. Hence, many believe in numerous gods and deities. Pray God will reveal to Munda that there is one and only God, who is both the ultimate creator while at the same the intimate personal Savior for all people as revealed through Jesus Christ. Pray Christians will naturally encounter and intentionally engage Munda people both in word and deed with the gospel.